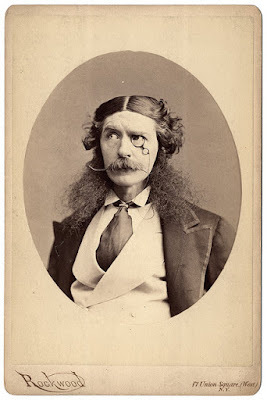 Today is the anniversary of the death Edward Askew Sothern, the spectacularly sideburned actor who played the comical Lord Dundreary on the night Abraham Lincoln was assassinated. A notorious prankster his entire life, his funeral was largely unattended because so many friends and family assumed it was a hoax. Perhaps no one has ever carried facial hair to such rapunzelesque lengths (see sideburns) as Edward Askew Sothern did in the late 1850s for the foppish character of Lord Dundreary in Tom Taylor’s comic play Our American Cousin. Though they were sometimes referred to as Picadilly weepers or Newgate knockers, it is unclear why his unusual sideburns came to be called dundrearies instead of adopting the name of their creator. Perhaps it was felt that calling them sotherns during the height of the American Civil War would have needlessly prolonged the duration of the conflict. Sothern was an English actor, born in Liverpool in 1826. His first professional acting gig was in 1849 in Lady of Lyons by Edward Bulwer-Lytton (whose now-infamous story opener “It was a dark and stormy night” provides the basis for the annual Bulwer-Lytton Fiction Contest for bad writing). Eventually moving to America, and wanting to be regarded as a serious actor, Sothern was somewhat hesitant to take on the supporting role of the weak-minded aristocrat Lord Dundreary in Our American Cousin. However, soon after the comedy premiered in New York in 1858, Sothern came to own the role and began ad-libbing and injecting exaggerated mannerisms into his performance that made him a sensation in the United States and in England. A key element of his comedic presence was his flowing whiskers that drooped down to his shoulders—a style that would eventually bear his character’s name. Sothern’s performance also helped coin another short-lived term—dundrearyisms—for his nonsensical combinations of colloquial phrases. Lord Dundreary famously remarked that “Birds of a feather gather no moss.” Sothern’s characterization was so popular that it spawned a number of sequels including Dundreary Married and Done For and Our American Cousin at Home, or Lord Dundreary Abroad. The original Our American Cousin was the play being performed at Ford’s Theatre in Washington, D.C. the night Abraham Lincoln was shot. John Wilkes Booth used as cover the riotous laughter following the line “You sockdologizing old man-trap!” to shoot the President. Sothern himself died at the age of fifty-four in 1881.